The village of Tilcara sits half way up the Quebrada de Humanhuaca at around 2,500m (7,500 feet). 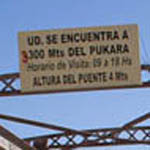 (Humanhuaca Gorge). This little settlement has been here since pre-Incan times, and one of it’s main claims to fame is the ancient ruins of Pucara.